What’s also true is that once in the ad business, many couldn’t imagine doing anything else. Particularly if they’re on the creative side. But times change. More than ever, people re-invent themselves. And if you want to stay successful in this game you have to keep doing just like that – after more than 25 years in the business I’m still a copywriter, but what I do now is unrecognisable compared to the early days, and it’s not just because the business has changed, either. Some advertising people, though, move into other fields, which while they may have a tangential relationship to what they used to do, they probably would never have dreamed of doing when they set out. I met one about a week ago. His name is Sam Roberts, and he used to be an account man at agencies like Lowe and Iris. Today, however, he does all kinds of things. He’s involved with D&AD, the advertising and design creative professional body, he does a lot of work with VSO in Cambodia, and he also runs hand craft lettering workshops. But it was one of his other great loves that was the reason for my meeting him. As part of the Stoke Newington festival, I went on a guided walk of ‘ghost signs’ around the area. These are faded adverts on the signs of buildings dating from the late nineteenth to the mid 20th centuries. Certain parts of London are full of these eerie sales reminders, and Stokey is one of them. If you’re in the neighbourhood and walking along Church Street or the High Street, keep looking up and you’ll start to spot them. Sometimes they’re even layered – two or three different ads layered one over the other – ‘palimpsests’, although it can be hard working out what was what, and when. Sam was the affable and knowledgeable guide on this and many other similar walks. 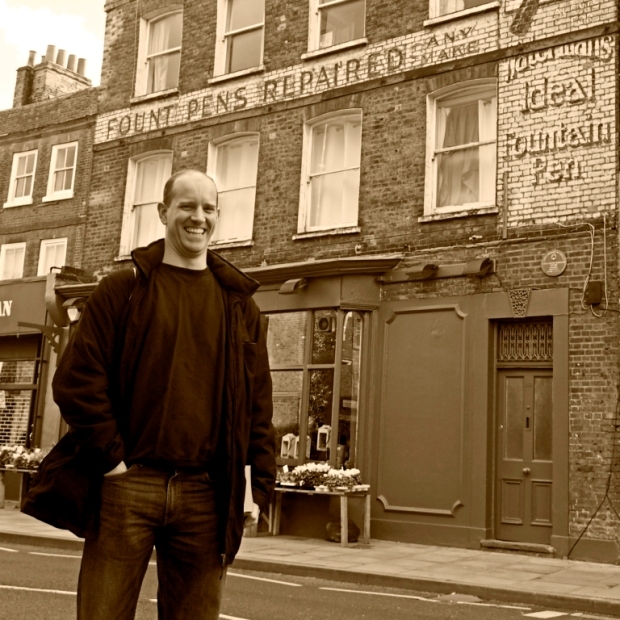 He is a great enthusiast for ghost signs, and has written extensively on the subject as well He’s even established a ghost signs archive as more and more of these signs are identified and deciphered. You can read and see lots more on the ghost signs website. From adman to ‘ghost hunter’ – not a bad change of pace. In the meantime, I’m still a copywriter. So if you’re looking for someone to write your website, advertising or sales collateral, please get in touch. This entry was posted in Advertising copywriting and tagged ghost signs, sam roberts. Bookmark the permalink.